Teaching and Developing online: A silly avoidable senseless loss, hits home. A silly avoidable senseless loss, hits home. My mind has been on the loss of the two youths in our community. My wife is an administrator at the school where they attended and is dealing with the impact of this loss. But as I scan through the facebook postings about this senseless waste which was avoidable it makes me sad. I am so very sorry for the loss which the families are now dealing with...I will keep them and theirs in my prayers and thoughts. But I keep coming back to the impact this has on the teachers, who are personally trying to deal with the grief and at the same time trying to help the students in their care. My wife is dealing with the personal loss of these two members of her school family, and trying to find answers and at the same time help the students in her care. I have a lot of teachers who I am friends with and I am struck by the hurt that such a senseless event has caused all of these teachers and how much of themselves they put into each and every student that they touch. I am humbled to see how they and my wife deal with the personal loss and senselessness of it and at the same time, be there to help the 1000s of hurting youths in their care. For this reason tonite I am praying for my wife and all the other teachers who vested so much into those two students and hope they find the strength to deal with the loss and the answers to help the other students who are left behind trying to make sense of this. A 17-year-old female faces additional charges in connection with a fatal crash that killed two Saskatoon teens Monday evening. The girl, who police say was a passenger in a stolen truck that collided with the vehicle carrying the teens who died, will appear in court Thursday to face six more charges including two counts of being a party to the offence of dangerously operating a motor vehicle while evading police causing death and two charges of being a party to criminal negligence causing death. She also faces one count for being a party to the offence of criminal negligence causing bodily harm and one count for being a party to the dangerous operation of a motor vehicle while evading police causing bodily harm. The youth originally faced three charges including possession of stolen property and breach of undertaking. The Youth Criminal Justice Act prevents publication of her name. Saskatoon police say a stolen truck with two occupants that was fleeing police caused a fatal three-vehicle crash Monday evening. 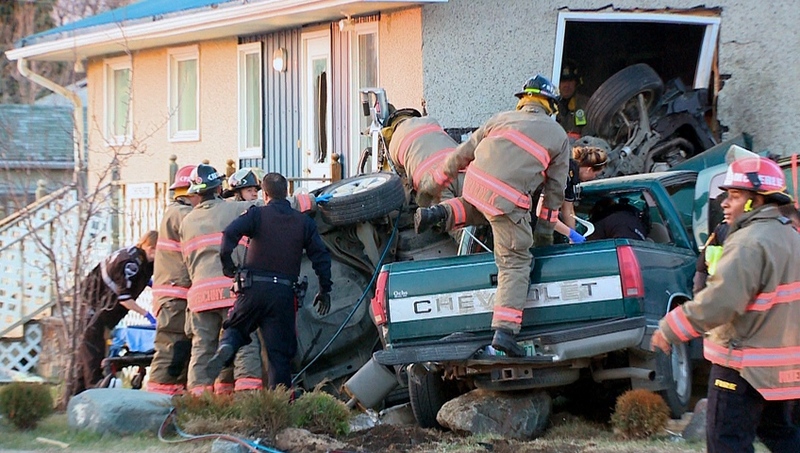 The woman accused of driving the truck, Cheyann Chrystal Peeteetuce, 21, faces 14 charges including impaired driving causing death, impaired driving causing bodily harm, flight causing death, dangerous operation of a motor vehicle causing death, and criminal negligence causing death. Peeteetuce is also charged with possession of stolen property and breach of probation. Police say a stolen pickup truck sped through the intersection of 22nd Street West and Avenue M Monday night and crashed into two other vehicles. One of them, a car, was pushed on its side and into the wall of a medical clinic. Two 17-year-olds in the car, a boy and a girl, were killed. A 16-year-old girl who was also in the car was taken to hospital with life-threatening injuries. Both Peeteetuce and the charged youth appeared in court Thursday. Peeteetuce was remanded until May 15. The youth was remanded until May 13.